A leading expert in researching new drug development in nanotechnology, and in the areas of molecularly targeted therapy, and chemoprevention, Dr. Shin is a highly cited physician-scientist in the field of translational head and neck cancer research and patient care. 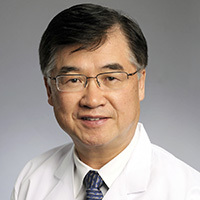 Dong Moon Shin, MD, FACP, is the Frances Kelly Blomeyer Distinguished Endowed Chair in Cancer Research, Professor of Hematology and Medical Oncology, Professor of Otolaryngology, Professor of Biomedical Engineering, Director of the Head and Neck Cancer SPORE Program and Georgia Cancer Coalition Distinguished Scholar at Winship Cancer Institute of Emory University. A board certified medical oncologist by the American Board of Internal Medicine, Dr. Shin is sought after for the treatment of head and neck cancer along with mesothelioma, thymoma and thymic carcinoma. Dr. Shin has a highly successful scholar and research track record as a head and neck cancer investigator. He is a well-established, internationally and nationally recognized investigator in head and neck cancer research related to biology, biomarkers, chemoprevention, biochemoprevention, new drug discovery by nanotherapeutics, and new molecularly-based and immune-based innovative therapies. Dr. Shin is a Fellow of the American College of Physicians and a Fellow of the American Association for the Advancement of Science, and has been recognized as one of America's Top Doctors in Oncology in Castle Connolly Medial Ltd., and Top Doctors in Atlanta Magazine since 2005. Prior to joining Emory, he served as a faculty member in the Department of Head and Neck/Thoracic Medical Oncology at MD Anderson Cancer Center, and also served as Professor of Oncology and Director of Head and Neck Cancer Program at the University of Pittsburgh. Dr. Shin graduated from Medical School in Yonsei University College of Medicine in Seoul, Korea in 1975. He completed Internships at Yonsei University Hospital in 1979 and at Cook County Hospital in Chicago in 1983. He also completed his Residency at Cook County Hospital in 1985 and his Fellowship at University of Texas, MD Anderson Cancer Center in Houston in 1988. Dr. Shin's research focus is in head, neck and lung cancers. During the past 30 years his research has been in the following areas: establishing carcinogenesis models in preclinical and clinical settings for head, neck and lung cancer; developing biomarkers in animal and human carcinogenesis for head, neck and lung cancer; developing molecular targeted prevention and therapies using epidermal growth factor receptor (EGFR) signaling pathways (i.e., EGFR monoclonal antibodies, EGFR tyrosine kinase inhibitors cyclooxygenase-2 (COX-2) inhibitors, other molecularly targeted molecules and several natural compounds; and developing novel therapeutics (clinical or translational protocols) for head and neck cancer, thymoma and mesothelioma. He is also currently focused on new drug delivery to cancer patients using nanotechnology in his research laboratory. Widely cited in many peer reviewed journals (more than 25,000 times), Dr. Shin has published over 340 scientific articles in journals such as The New England Journal of Medicine, The Journal of the National Cancer Institute, Cancer Research, Clinical Cancer Research, The Journal of Clinical Oncology, Nature Biotechnology and many others. He has served on the editorial boards of 15 scientific and oncology journals.